Finally, the jeep is at the port. We got up late this morning and took our time getting ready. Ilissa and Justin made us comfortable in a hundred thoughtful ways. We have a beautiful room to stay in, and our own bathroom. They also went out and got groceries for us. Things like my cereal and deli meats so we can make sandwiches. We were told to make ourselves comfortable, like it was our own home. She introduced herself as Auntie Lil to Baxter and Lucy and by the end of the night they were snuggled up next to her on the couch along with her cute pie Shitzu Molly. Last night, our first night, Justin made a fantastic dinner; steak that had been marinated for 2 days in Stubb's Marinade , sauteed zucchini and yellow squash, scalloped potatoes and sauteed mushrooms and onions. Fantastic! I usually don't eat a whole steak, but I ate all of it! They bought a local red wine, we are in the Temeluca region, and Dan and I drank the entire bottle. After dinner we hung out, on the couch, in the garage, smoking and Dan and I drank another bottle of red - funny how much you can drink at sea level - and we talked the evening away, going to bed at 11. Tuesday morning, Justin got up at 6, to start his day. Dan, Ilissa and I converging around 8:30. She works at home so we left her to her work and made the long drive back to Long Beach. The rain had stopped last night, so the drive was a lot quicker and a lot less tense. Dan dug out the car stereo and made my drive much easier. My buddy Tiffany gave me a Lady Gaga CD and she got us to Long Beach in style! We were there in 90 minutes and had to wait 45 minutes for the ship yard guy to call and give Dan the shipment number. 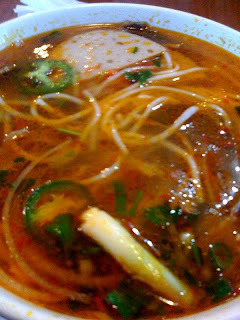 Starving, we ate Pho for the first time. The spicy beef soup was delicious and warmed me up. The rain started back up again and it was slow going on the way back. 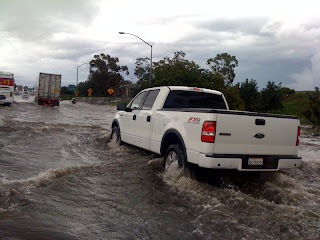 It is so saturated here that the roadways and highways are flooded in some areas. For dinner, Justin made spaghetti and meatballs. But these weren't just any spaghetti and meatballs! The sauce and meatballs were home made! I am in heaven, the meal, with salad and garlic bread is delicious. I prod about his sauce but he won't give me too many details! We spent the evening playing the game Apples to Apples and went to bed at 11. I am so grateful to have such a fun, loving, thoughtful, beautiful, sweet friend like Ilissa, I'm glad we made time to visit before going to Kauai and I'm comforted that she has such a kind and loving husband. Than marinaded steak with zuchini and squash sounds awesome.